I should have written this blog a long time ago, but it's better late than never. Some of you don't know how to subscribe to a blog. That's okay I will teach you. It is very easy to subscribe to my blog and many others like it. I actually subscribe to my own blog (more on this later) and I find it very convenient. 1). Email: the easiest way to subscribe. If you wish to receive an email everyday between 9AM-11AM this is the best option for you. It is quick and easy. However, email has a HUGE downside. Blogs are ONLY delivered between 9AM-11AM. If I write a blog at 12PM you won't get it via email until the next day between 9AM-11AM. If I write a blog at 8PM you won't get it via email until the next day between 9AM-11AM. Think of an email subscription this way: You get your morning paper every morning around the same time. The paperboy comes once a day, but the news keeps happening all day. You won't read about that news until the next day when the paperboy drops off your morning paper. That's how email subscription works. Once you put your email address in that box a verification code will pop up. Verify that code and check your email and your SPAM folder. 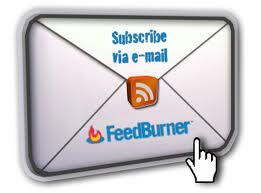 You're not subscribed until you verify the email that feedburner sends you. 2). 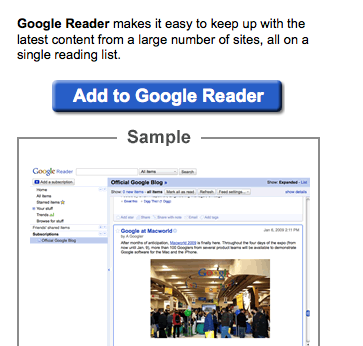 Google Reader and all other readers: This is the fastest way to get my blog. Once I post a blog my blog feed updates immediately. 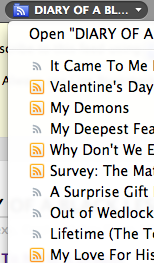 People who subscribe via Google reader, yahoo, etc get my latest blog post within 20 seconds. There are several ways to subscribe via Google reader etc. Side note: I think you need an email account to use Google Reader, Yahoo, etc. It is FREE to create one. You will then be able to read my blog through that reader. 3). Last, but not least, you can subscribe to this blog the way I subscribe to my blog using Firefox (you can follow these same steps if you're using Safari, Opera, etc...I think...don't quote on it). Step one: Go to the homepage of my blog using Firefox. Step two: Go to bookmarks and click "Subscribe to this page." Scroll down to "Subscribe to Diary of a black lesbian-Rss" and click on it. 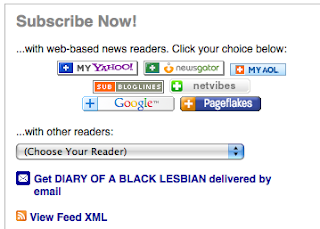 Hit subscribe if you want your subscription to Diary of A Black Lesbian to appear on your toolbar. If you want it to appear somewhere else change the "Bookmarks Toolbar" scroll to your desired location. I personally recommend that you leave it as "Booksmarks Toolbar." And that's it! If you have any questions send me an email or drop your question in the comment section of this post.